The literature on the effect of labor income on portfolio choice overlooks that workers face a risk of being forced to retire before their planned retirement age. Using the Health and Retirement Study data, this paper finds the forced retirement risk to be significant and also highly correlated with stock market fluctuations. 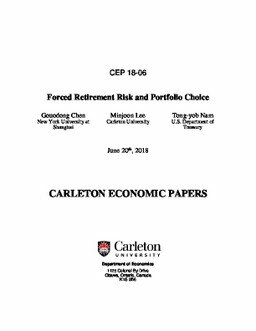 A life-cycle portfolio choice model with the estimated forced retirement risk shows that the labor income of those subject to the risk of forced retirement becomes stock-like as individuals approach retirement. Therefore, contrary to conventional wisdom, those who are still working but close to retirement should have a lower share of risky assets in their financial portfolios than retirees do. Given that most financial assets are held by middle-aged households, this finding gives an alternative explanation to the risk premium puzzle. Chen, Guodong, Lee, M, & Nam, Tong-yob. (2018). Forced Retirement Risk and Portfolio Choice (No. CEP 18-06). Carleton Economic Papers (CEP). Department of Economics.